INFOMINE (Scholarly Internet Resource Collections) – A library of resources for research on numerous subjects. Articles, e-books and journals are among the searchable reference materials; subjects range from science to the arts. The Literature Network – Boasting an index of over 3000 books plus short stories, and poetry, this library includes a quotation database. Try out the quiz section to test your knowledge. Artcyclopedia – “The guide to great art online.” This reference site provides access to links, books, images, museum galleries and articles of over 9,000 artists. Research material is available for art movements as well. Resource Library – The CBS Interactive Business Network Resource Library; search articles in major publications for topics including: Business, Technology, Sports, Careers, Home & Garden; Arts and Health. Project Gutenberg – Here you will find over 36,000 free e-books for downloading (ePub, Kindle, HTML and simple text). Project Gutenberg has a volunteer-based program called Distributed Proofreaders whereby readers may collaborate in proofreading segments of public domain books for conversion to e-books. Shakespeare Searched. – Think of this as the Shakespearean’s Google, as it’s more of a search engine than library. It is a terrific tool for locating the Bard’s works via keyword queries. If you know a line, word or phrase and need to find where it appears, this is where to search. 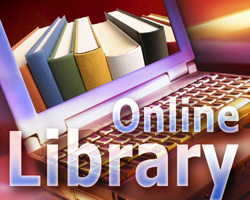 The Goddard Library – An invaluable reference source for technical and scientific research, the Goddard Library is part of NASA’s Goddard Space Flight Center. The Cool Sites link is a great place to begin your exploration. 50States.com – For information about any of these United States, from state birds and songs to local newspapers, this is your source. An excellent assortment of study tools for teachers and students is here. Wiley Online Library – A huge research database for subjects including physical sciences, health, social science, humanities. Access to over 4 million articles, 10,000 online books, using easy-to-follow tutorial aids and videos. Libdex – A library of libraries as it were, Libdex is a directory of libraries throughout the world. You can also use the site’s search function to locate books.